Astondoa Shipyard announces the appointment of Yachtside as dealer to operate in Thailand its office in Phuket. Yachtside, part of group Be in Yachts, is a company with a strong international focus, with offices in Monaco and now in Thailand, specialized in yachting, as well as in the management of yacht charters. Founded by Phillippe Chadel more than 25 years ago, it was appointed dealer Astondoa Monaco a few months ago, an agreement that is now expanding. With this agreement, Astondoa reinforces its international strategy that has been developing since last year with the introduction of new models recently presented at the Cannes Yachting Festival. On the one hand, the Astondoa 80 Flybridge, an evolution of the previous model that, through its lines, adapts to the new designs of the shipyard; and, for other, Astondoa 100 Century, the consolidation of the project Century, a 30,50 meters yacht which exterior and interior, innovative but stable design, there is work of the department of design of the shipyard as its older brother the model Astondoa 110 Century. At the gala evening organised by Christofle Yacht Style Awards 2019 to mark the Thailand Yacht Show and RendezVous, Azimut Yachts, for the second year in a row, collected the prestigious prize won by the new entry in the Grande collection. Azimut Grande 25 Metri climbs to the top step of the podium and wins the “Best Motor Yacht in Asia” Award in the 25-30 meter category. The panel at the Christofle Yacht Style Awards 2019 recognised and rewarded the most outstanding models for innovation, style and build quality, as well as for their ability to deliver an exceptional cruising experience for the owner and, finally, their special focus on the Asian market. These are all characteristic qualities of Azimut Yachts’ Grande 25 Metri, which is a model designed to amaze and features a style that achieves the ideal balance between charm and technology. Ferretti Group reaches the top even in the snows of Cortina, with 2 dazzling trophies earned by Custom Line 120’ “Vista Blue” and Riva 110’ Dolcevita, two nautical masterpieces Made in Italy. The Group also triumphed at the tenth edition of the Design & Innovation Awards, sponsored by Boat International Media, prestigious publishing group in the international yachting world. The panel selected the winners in each category by assessing design, style and on-board comfort, taking into account technological and design innovation. Custom Line 120’ “Vista Blue” won in the Best New Production Yacht Design category. This new planing yacht conveys the values of seaworthiness, comfort, safety and customization - all part of Custom Line's DNA since the beginning - in a revolutionary product in terms of its style, design and spaces. Jointly produced by the Product Strategy Committee under the engineer Piero Ferrari and the Ferretti Group’s Engineering Department, it is the first Custom Line vessel conceived by Francesco Paszkowski Design. Riva 110’ Dolcevita won the award in the Best Exterior Styling Motor Yacht category. The result of cooperation between Officina Italiana Design, the studio founded by designer Mauro Micheli together with Sergio Beretta, and the Ferretti Group’s Product Strategy Committee and Engineering Department, the 110’ Dolcevita was received with enthusiasm by the panel for its exterior design, with its ultra-sporting profile, and the yacht's aerodynamic qualities, further boosted by the lateral structures in glass. Consistently with the brand's heritage, sophisticated design choices and innovative technological features make this flybridge an exceptionally beautiful yacht. Ferretti Yachts has had a great start to 2019: its latest masterpiece, the Ferretti Yachts 670, triumphed at the second edition of the Christofle Yacht Style Awards. The prominent international initiative celebrates nautical excellence worldwide and the prestigious accolade has even more firmly established the brand’s success in the Asian luxury market. The event was launched last year to mark the tenth anniversary of Yacht Style, an authoritative magazine in the field. This year’s edition is stepping things up a gear. There are two sections: one for motor and sailing yachts under 30 m and one for superyachts, with a total of 30 categories for the awards, which will be presented on two different evenings. The ceremony for the first section took place yesterday (Wednesday 9 January) against the spellbinding backdrop of the Café del Mar in Phuket, where the Ferretti Yachts 670 was named the “Best Motor Yacht in Asia (15-20 m)”. The new nautical marvel by Ferretti Yachts has taken the style, comfort and performance that have always been part of the brand’s DNA to an even higher level. One distinctive factor that gives it an edge over its rivals is the outstanding space design: the Ferretti Yachts 670 measures 67 feet (20.24 metres), but it boasts a number of solutions typically seen on larger vessels. Light pours through enormous, elongated windows into the stunning lounge, while below decks a sizeable owner’s suite with a study can be found alongside four guest cabins. At SVP Yachts, Slovenia based producer of Greenline Yachts, OceanClass Yachts and Shipman Carbon Yachts, they have been on a growth rampage in 2018, signing up a total of one dozen new dealers. Latest additions to the dealer network since summer 2018 are: After singing up Ultramarin in south Germany at the beginning 2018 the network development in the country grew by a new addition, Yacht Center NRW with their large indoor showroom close to Düsseldorf. This young ambitious team with Torben Budde at the helm, started by importing used boats and specialized in refitting them, has now grown into one of the biggest dealerships in the Dusseldorf area with sales, service and winter storage. In Norway after started working with W-Yachts with offices in Stavanger and Oslo. W-Yachts was founded by Ola Andre Worre and his father Paul Vidvei Worre in 2007 and have been specializing in sailing and trawler type yachts so Greenline Yachts fit perfectly into their product portfolio. In Denmark Greenline Yachts will be represented by FloorYachts founded by one of the most famous marine experts in Denmark Michael Floor. FloorYachts offer their clients to choose their yachts in their indoor showroom located in Randers on Danish East coast. Their debut with Greenline Yachts will be at Fredericia Boat Show with the Greenline NEO on display. Greenline also signed up the first dealer in Italy. M3 Servizi Nautici is a family business with more than 30 years tradition, based in Andora close to Sanremo on the beautiful Italian West coast with offices in Andora and Lavagna. "Italy is a big market and we will be adding dealers in the East and in the South of the country shortly, but M3 Servizi Nautici has the prime spot and are very well respected in the area which is the kind of establishments we are looking forward to working with in the future" said Mr. Meffle. Also signed up is TOT Nautic in Palma de Mallorca. TOT Nautic is one of the biggest boat sales company in the Balearics with an indoor and outdoor showroom. TOT Nautic is also a family business with CEO Jimmy Schwartz who as the second generation owner of the business with his father founding the business overt thirty years ago. Together with Andre Nelles, responsible for sales and marketing and more than 20 years of experience we have a great partner for the sunny islands. Officially started already before Southampton Boat Show with a quite successful first show, Greenline is proud to announce that they have started working with Clipper Marine in the UK. Clipper Marine is a well established boat sales company with years of experience and six offices across the UK with Matthew Attree and Richard Hewett at the helm. Greenline is also growing in the Southern hemisphere. In Chile we signed up Mares Chile, a well established boat sales company with majority of focus on sailing yachts where Greenline Yachts range will compliment nicely with the majority of Greenline Yachts owners being former sailors. The first Greenline 33 is already on its way to Chile. Horizon Yachts is pleased to announce that the company’s specialized composites corporaton, Atech Composites, recently broke the world record for a single-shot hull infusion, this time with a 140-foot hull and stiffeners, utilizing their improved 3D infusion technology. 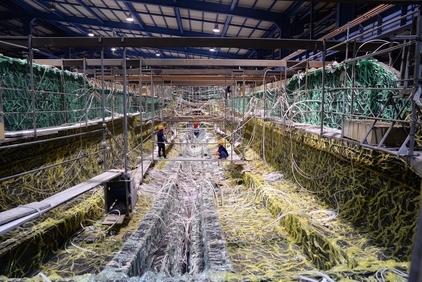 Horizon’s Atech facility began using the patented SCRIMP “vacuum infusion” technology in manufacturing one-piece hulls and became the first shipyard in Asia to utilize the procedure. In 2004, Horizon developed an improved resin infusion technology, which transforms the resin from its original 2D flow on surfaces to 3D flow. Invictus staff grows, with Ms Lucia Cancellara appointed as Marketing Manager and referent for the Dealer Network. Ms Cancellara was born in Milan in 1974 and graduated in History of Art from the University of Milan in 1999. She has been developing her professional career in marketing and communication since 2001, working in major multinational companies in different economic sectors. She held progressively higher positions with increasing responsibility (starting from ESRI Italia, then becoming Communication Manager for Garmin Italia and Head of Marketing Kaspersky Lab Italia). Over the years she developed her skills in b2b and consumer marketing strategies. Pacific Asian Enterprises, Inc. is pleased to announce the first-ever Nordhavn Film Festival taking place in October. Based on the popularity of Nordhavn cruising videos, and the effort most put into comprising a video post, PAE decided to hold a competition to see who can produce the greatest Nordhavn cruising video. The winner takes home bragging rights and a cash prize of $10,000. The contest is open to anyone – current and past owners as well as their guests – who can create a quality video between five and ten minutes long. The only condition is at least 75% of the film must contain material that hasn’t been previously posted online for public view. “For Nordhavn owners, the desire and ability to take amazing video has almost become a pre-requisite for voyaging,” said Nordhavn’s vice president Jim Leishman. “I think the opportunity to put their absolute best foot forward in the creation of a cruising documentary is going to be an exciting one for most.” A volunteer panel made up of PAE staff, industry professionals and friends of the company, will judge videos and determine a list of finalists. Finalist videos will be premiered at the Nordhavn Film Festival next October at the company’s World Headquarters in Dana Point, CA, where winners will be announced at a lavish black-tie ceremony. InfiniteYachts Asiahasbeenchosentorepresent OCEA Yachtsonthe Thaimarket. The two partners will be present in January at the Thailand Yacht Show in Phuket. "We opened in 2011," explains Giovanni Toumi, manager of Infinite Yachts. “The company specializes in the sale of new and used boats, as well as yacht management and charters.” Initially located in Golfe-Juan, Infinite Yachts has since opened three other offices in Saint-Tropez, San Remo and, in 2016, in Phuket to represent Sunreef catamarans. "Business in Europe is somewhat erratic, especially in winter," says Giovanni Toumi. “This is why we looked for another location. We considered the United States, but there are too many competitors. Asia, on the other hand, still has only a few brokers. The ports are developing very quickly and it is very open to international trade. Today, the market is booming. Phuket already has four marinas, and a fifth is under construction for yachts up to 100 metres. Now is the right time to be there!" The Mangusta Gransport “El Leon” has won the “Best Interior Design Motor Yachts 300GT to 499GT” award at the Design & Innovation Awards 2019. This year the Design & Innovation Awards were held in the magnificent setting of Cortina. Organized by Boat International Media and among the most prestigious awards in the boating industry, they are awarded to recently designed yachts after a thorough evaluation not only of their architecture and style, but also of the design features that contribute to the creation of innovative solutions. A key role is also played by technological and design innovation. 54-meter “El Leon” was introduced to the public and to the yachting industry as a whole at the recent Monaco Boat Show, and she was an immediate success. She is the largest yacht ever built by the Mangusta Shipyard and the first model in the new generation of aluminum Fast Displacement vessels, the Mangusta GranSport line, designed by the Shipyard’s engineering departments in cooperation with engineer Ausonio and designer Alberto Mancini. ”El Leon” conquered the jury – composed of owners, experienced captains and renowned yacht designers – for her being an innovative yacht, combining stylish design, huge spaces and plenty of light with advanced technological solutions that express her Mediterranean style at best and go hand in hand with classy lifestyle and onboard comfort and wellbeing. “The first of a new series – this is the motivation of the Jury – El Leon boldly combines the look of a sporty yacht with the liveability of a displacement motor yacht. The all-aluminium fast displacement hull and four engines deliver the speed element typical of Mangusta’s DNA - all reflected into truly spacious interiors.” The Owner, who knows Mangusta very well, contributed to customizing the yacht’s layout and décor, adding a gym and a private office, and requesting special finishes and specially-selected woods. Distinctive features of this low, sleek yacht – like the floor-to-ceiling windows and a 2.6 m saloon overhead height - required in-depth studies and world-class construction skills and craftsmanship. Other example of this are the air-conditioning fan coil units skilfully hidden in elegant freestanding furniture, the wooden staircase - featuring a waterfall-effect veneer - that from the main deck lobby floor leads to the guest deck, and the innovative solutions drawing inspiration from the automotive industry and effectively reinterpreted for the boating industry by the Shipyard. This prestigious award is an important acknowledgement of the Shipyard’s work, together with designer Alberto Mancini and the Owners, and ability to build a truly unique yacht. This is the second international award the Mangusta GranSport 54 has won just a few months after her debut on the international market. Australia's premium luxury motor yacht builder, Riviera, continues to grow in the Americas with the appointment of Sun Country Marine as representative in southern California. Sun Country Marine has three iconic coastal locations - at San Diego, Dana Point and Newport Beach. The company celebrated its 30th anniversary at the end of last year by opening two additional coastal offices, at Marina Del Ray and a second office in Newport Beach. Sun Country Marine CEO Mike Basso said: "We are delighted to join the Riviera family. We have a great synergy with Riviera in our commitment to quality and to owner care. "We were particularly impressed by Riviera's spectacular nine-model showcase during the Fort Lauderdale International Boat Show late last year. It demonstrated a genuine commitment to the highest level of presentation of quality motor yachts. "Riviera's five unique collections across Flybridge, Sport Yachts, SUVs, Sports Motor Yachts and the classically styled Belize models offer the options our clients demand. "Our commitment to ensuring clients can directly touch and inspect new motor yachts is borne out through the nine new Riviera motor yachts, including three SUV models and three Sport Yachts that are now in production. We also have two 39 Sports Motor Yachts and a 395 SUV that will be arriving in southern California in early 2019. "We are proud to join Riviera to display three new motor yachts at this weekend's San Diego Boat Show. We will have 445 and 525 SUV models and a 4800 Sport Yacht for boating enthusiasts to inspect." Riviera CEO Wes Moxey said that Sun Country Marine has for many years demonstrated a thorough understanding of the motor yacht market in California and is held in high esteem. “Riviera has a large and loyal owner base in California and Sun Country Marine will provide powerful support and service to our existing owners as well as to a growing market of luxury motor yacht enthusiasts. "Our world-renowned quality, luxury, innovation, blue-water sea-keeping abilities and superior owner support will be further enhanced with the appointment of Mike Basso and his Sun Country Marine team." Sanlorenzo, a leader in world production of yachts and superyachts, returns to entirely Italian ownership. Sir Massimo Perotti, Chairman and CEO of the company, has in fact repurchased 23% of the shares from the Chinese Sundiro Holding company, that he had decided to include in stock ownership in 2013 to deal with the crisis that the boatbuilding industry was experiencing, with an agreement to support its partner in building boats (not under the Sanlorenzo brand) under 20 meters long in China. Sanlorenzo SpA was assisted in the negotiation of the transaction by Studio Musumeci, Altara, Desana and Associates for the legal aspects and by RSM Studio Palea Lauri Gerla. This is an important milestone that now makes the Perotti family owners of 96% of the company shares of Sanlorenzo SpA through the Happy Life Holding company (which also includes the two children Cecilia and Cesare Perotti) after the other repurchase a few months ago of the 16% share that had been sold to Fondo Italiano di Investimento in 2010. Management holds the remaining 4%. These operations once again confirm Sanlorenzo’s positive growth results over the past few years.“The numbers reported demonstrate it fully: revenue has grown from 300 million in 2017 to 380 in 2018, and for 2019 we are forecasting additional growth of 20%. Furthermore, we have an order backlog of 500 million for 2019 and 2020. However we are not stopping here, and we expect to invest100 million Euros by 2020, of which 52% will be in new facilities to increase our production capacity, 42% in new products expanding our product offering with new models able to satisfy the growing demand of the international market, and 6% in R&D.” Massimo Perotti Along with these significant investments, the company has furthermore recently started a significant initiative focused on youth: the “Sanlorenzo Academy”. Born from an idea of Sir Massimo Perotti, who once again shows his ability to be farsighted, the Academy is focused on developing specialized professionals who are currently lacking and in high demand in the job market, providing training opportunities to youth with an emphasis on hiring. This initiative will create a significant virtuous circle between industry, training, and the world of work, investing in new generations and creating jobs. As further confirmation of the results achieved, Sanlorenzo has attained first place in the ranking of world’s leading producers of boats over 30 meters in lenght (superyacht) with 39 boats delivered in the 2016/17/18 triennium. Published last month by the Dutch Superyacht Times magazine, the analysis compares the data from the last three years with pre-crisis results, showing how Sanlorenzo has tripled its own production over the years, exceeding even the biggest boatbuilding groups. A true leader at the forefront of the nautical world, this year Sanlorenzo also climbs onto the podium of the classic annual ranking of the Global Order Book, compiled by the English boating magazine International, once again confirming itself among the main three shipyards in the world in the production of yachts and superyachts and first as a single brand. Each year, the ranking reports the status of the yachting industry over 24 meters in length. Britain’s biggest boat builder, Sunseeker International has today announced that Christian Marti will join the business as Chief Executive Officer in November, replacing Phil Popham who left the business at the end of September to take up a new challenge. Marti joins Sunseeker from Aston Martin Lagonda where he held the position of Chief Sales Officer and Vice-President. Having worked within the automotive industry for over 25 years he brings with him over 18 years of senior management experience across European and Asian markets with premium luxury brands such as Jaguar Land Rover and McLaren Automotive. During his time at Aston Martin, he was a significant part of the executive team that transformed the iconic British brand into the successful business it is today. John Zeng, Dalian Wanda’s board representative for Sunseeker commented: “We are delighted to welcome Christian to Sunseeker International. He has an impressive and proven track record of growing the financial performance of major manufacturing businesses and a strong affinity for global luxury brands. Christian joins us at a crucial time for Sunseeker as we move into our next phase of growth and I have no doubt he will help us build upon the incredible work already undertaken by the team in achieving a remarkable business turnaround in record time.” Commenting on his appointment, Christian said: “I am delighted to be joining Sunseeker at such an exciting time. The business has recently embarked on a five-year growth strategy and the company is sitting on its strongest ever order book with continued investment in new product and facilities at the heart of the business plan. I look forward to working with the Sunseeker team on the future opportunities to grow this already outstanding, world-famous luxury brand.” It is indeed an exciting time for Sunseeker who are looking to strengthen its position at the forefront of the global superyacht market with the announcement of a new larger flagship model, to launch in 2021. The new 161 Yacht will also see the brand move into aluminium built vessels for the first time through a collaboration with renowned Dutch builder ICON Yachts. Sunseeker International will once again be highlighting the topical issue of marine conservation at Düsseldorf Boat Show with an immersive experience for visitors that will demonstrate the importance of protecting our seas and oceans for future generations. Sunseeker is passionate about the marine environment and last year launched an exciting conservation program on the Balearic Island of Menorca with its long-term charity partner, The Blue Marine Foundation (BLUE); a charity dedicated to creating marine reserves around the world and improving biodiversity. The compelling exhibition, that will be free to guests at the show, will highlight the facts and the problems we currently face globally, with increased pressure from unregulated fishing, tourism and pollution. Sunseeker will be showcasing its commitment to tackling the issue with details on its partnership with BLUE and its recently launched marine conservation program, ‘Project Menorca’. Project Menorca, which is supported by local partners on the island, including the Menorca Preservation Fund, will support local fisheries in creating a model of sustainable fishing, establish a network of ‘eco-moorings’ to preserve seagrass beds, protect marine reserves by removing plastics and ‘ghost’ fishing nets, distribute recyclable bags across the island and recruit on-water rangers for various marine monitoring programs. This challenge presents an ideal opportunity to make a tangible difference in protecting Menorca’s marine environment and Sunseeker aims to widen the programme worldwide. Sunseeker is also supporting BLUE’s virtual Blue Marine Yacht Club (BMYC). Launched in 2012 by His Serene Highness Prince Albert II of Monaco, the BYMC was formed to unite the global yachting community in a clear mission to protect our oceans. Sunseeker fully endorses the BMYC and offers three levels of membership with all revenue raised going directly to supporting BLUE’s work in Menorca. Dependent on the membership level, donors will be given the unique opportunity of having a guided tour of the Menorca project first-hand or at the highest level, naming rights to this or other projects. BMYC has also developed its own eight-point ‘Charter’ which makes simple observations about how to reduce the impact of boating with very little effort whilst supporting biodiversity and hence its sustainability. The code of conduct, which is promoted by Sunseeker, includes information on topics such as reducing damage from anchoring and mooring, stopping marine pollution, the recognition of protected areas, as well as diving and snorkelling best practice. With the launch of Project Menorca, Sunseeker is encouraging everyone to think about how they can help protect our most valuable resource. Congratulations to the Hendersons and the Fragrant Harbor crew! With Captain Joe Garberoglio behind the wheel, the Viking 60 released 13 sails to become the champ of the 82nd Annual Silver Sailfish Derby. Owen Buckman released five of those fish to claim 2nd Place Angler while David Henderson took 3rd Place Angler with four sails. Captain Joe earned the Top Captain award. Established in 1935 by the West Palm Beach Fishing Club, the derby this year saw the 43-boat fleet release 201 sailfish over the two-day tournament. Congratulations to Captain Robert Collins and the crew of the Last Dance on their win at the Islamorada Sailfish Tournament. Robert, fishing Janet and Erik Akin's Viking 52, led anglers Matt McLean, Mark Wodlinger, Ken Longaker and Robert Helms to 14 sailfish releases. Ten of those releases were on the last day, creating a lot of action in the pit. Matt released seven of the sails earning the title of High Point Angler. Robert received the High Point Captain award. Brandon Hopper and Dallas Hopper on the Last Dance took home High Mate awards. The Islamorada Sailfish Tournament is the first leg of the Florida Keys Gold Cup Sailfish Championship. This win puts Last Dance at the top of the board. The next leg in the series is the Islamorada Fishing Club Sailfish Tournament beginning on January 24, 2019. The 2019 Quest for the Crest Sailfish Series kicked off last week with its first leg, Operation Sailfish, in Palm Beach, Florida. A pair of Viking 62 Convertibles landed in the top three amongst the 36 teams competing to claim the champion dog tags and a piece of the purse. Steve and Susie Pfeifer's MDALA released four sails on Day 1 then jumped ahead of the fleet with six releases in the first half of Day 2. They finished in 2nd place with 13 sailfish. With 12 releases,Team Kluch fishing on Reel Easy rounded out the top 3 compliments of a quad they hooked at the end of the final day. Those four fish catapulted them from 10th place to 3rd place and secured a great start in the Quest for the Crest Series. At the opening of Boot in Düsseldorf, Ferretti Group announced the entry of Wally, the iconic luxury nautical brand and emblem of design and innovation, within the portfolio of its brands. Through an exclusive license agreement of the Wally brand, the Group further enriches its range, which thus becomes the widest and most innovative of the entire Italian nautical industry. The license agreement represents a fundamental step in the brand acquisition process and allows the Group to work immediately on the further development of the brand. In the four-year period 2019-2022 Ferretti Group will invest over 84 million euros - 70 million euros in the first two years - in the development of the brand and in the design and construction of new product ranges. The new Wally models will be built at the Ferretti Group shipyards, in particular the Super Yacht Yard in Ancona will be the reference plant for Wally’s largest yachts. During the Düsseldorf press conference, Ferretti Group presented the first project of the new-era, the 48 Wallytender, which will be one of the most anticipated premières at the Cannes Yachting Festival 2019. Alberto Galassi, CEO of Ferretti Group, said: "There has long been a mutual fascination between us and Wally and from today we will continue to develop this extraordinary brand with method, vision and investments. And with the same energy and creativity that have lead Ferretti Group the top of the yachting world. As yachting enthusiast, I’m looking forward to discover the boats that will come from the exclusive collaboration with Luca Bassani: it is easy to foresee that they will push the frontiers of innovation and aesthetic avant-garde to new echelon". Luca Bassani, founder of Wally, commented: "The market today requires significant investments to develop new products and new markets. Ferretti Group has great industrial, organizational and commercial capabilities and will be able to boost Wally. I will continue my design and development activity on an exclusive basis, ensuring the continuity of Wally's DNA. All the years and the effort to build the brand will have a continuation. I could not wish anything better for Wally's life.” Thanks to the agreement with Ferretti Group, Wally returns to the Boot in Düsseldorf, where it had not been exhibiting since 2004, which stands out for its innovative and technological concept, elegantly expressing all the styles of one of the most iconic brands of the nautical world.